I worked for an international airport and although, as you said, no doubt there are many successful air transport stories of pets being shipped successfully, I have also witnessed horrors such as dogs who escaped their crates and had gotten outside of warehouse buildings and were wandering outside on active runways while various workers chased after, trying to recapture them. 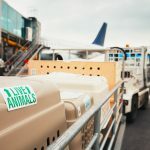 This is not only a danger to the pets but to the workers as aircraft are taking off and landing while some poor housepet is right in the danger zone, frightened, and bewildered! Not something I ever want my own animals experiencing!